I will normally post your Prayer Requests as soon as I can. If you DO NOT want me to post your e-mail address with your Prayer Request, just say "Please Do Not post my e-mail address", and I will NOT post your e-mail address with your Prayer Request. You will receive an Auto Response E-mail from us that will let you know that we have received your Prayer Request. Please! try to keep the length of your Prayer Requests to a reasonable length. me the following information, your e-mail address and the words Prayer Warrior. PLEASE ONLY SIGN UP IF YOU WILL BE A FAITHFUL PRAYER WARRIOR!! Pray For Those Who Do Not Have The Peace, Knowledge, And Salvation Of Jesus Christ In Their Lives. 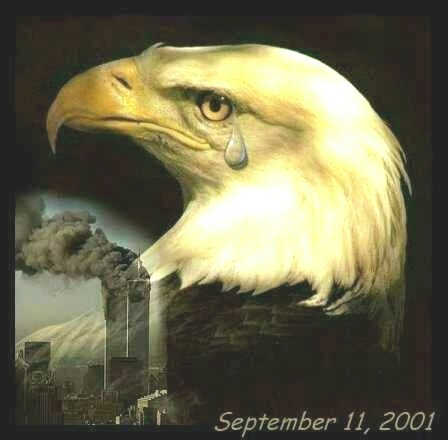 September 11th, That Date shows up as 911, The Emergency Phone Number Do You Think GOD is Trying to Tell us Something? Why did GOD allow 9/11 to Happen? Click Here for the Answer. I leave my prayer to Him alone, Whose will is wiser than my own. On display in the French Academy of Science is a shoemaker's awl. It looks ordinary, but behind that little awl are both tragedy and victory. It fell one day from the shoemaker's table and put out the eye of his nine-year old son. Within weeks the child was blind in both yes, and had to attend a special school for the sightless. At that time the blind read by using large carved wooden blocks that were clumsy and awkward to handle. The shoemaker's son, when he grew up, devised a new reading system of punched dots on paper. And to do it, Louis Braille used the same awl that had blinded him. Tragedy will come into each of our lives, but we can choose how it affects us. When it strikes, some of us ask, "Why did God allow this to happen?" Others ask, "How will God use it?" Father, even when we do not understand Your purposes, help us to seek Your will. bring it to the Lord in Prayer. Please be in Prayer for the UNITED STATES OF AMERICA. With our president I am in Great Fear for Our Country, Our Freedom, and Our Religious Freedom. Please Pray that the LORD will protect us from his attacks, and the attacks of those who support him. I do not understand why the LORD allowed this to happen. But, I Do Know That His Plan Is Perfect, and I Trust Him. Maybe this is how the LORD is going to wake up this country. Pray that this ministry will continue to grow and spread GOD'S word around the world. Please pray for Revival in your country, the United States, and the world ! Pray for the leaders of Israel, that they will receive wisdom and courage, and that the people of Israel will come to know the LORD and not stray from him. Please pray for Dorian M. in Placerville California. She has turned her back on the LORD and is delving into witchcraft. Please join with me in asking the LORD to open her heart and eyes. Thank You Very Much! Sara, Daughter, Gone from family, into Witchcraft!!!!!!! Please also Pray that the LORD will open the hearts and eyes of Norma and Michael who are followers of satan. Please pray that my former husband, Jerry, is delivered out of witchcraft, and away from Virgina, a tarot card reader he left me for 15 years ago. I have not seen him since. My name is Deborah. i live in, oregon. i am not saved. need prayer for deliverance of evil spirits in me. my spirit is possessed. i can control what's happening in the spiritual realm thru dreams i have. im scared and need help asap. please also pray that soul ties are broken between me and woman name patsy, who lives in, florida. may her spirit return to her and my spirit return to me.